keeps a large inventory of fuses in stock and have the capability of providing many more. We are a proud distributor of Bussmann and Mersen (Gould Shawmut). We stock 600 volt – 24 volt, large and small dimension fuses. 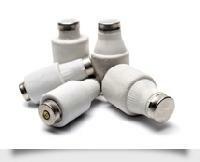 Many of the accessories that accompany these fuses are also kept on hand, such as fuse blocks and reducers.